If after reading our articles on choosing a colour scheme for your bed and breakfast you are still uncertain about your choices, it might be worth employing an interior designer. There's no getting away from the fact that this will cost money, but it might be cheaper than doing it all yourself only to have to redecorate the following season because of bad feedback from clients. All good bed and breakfast owners will be collecting guest feedback to help improve their businesses. Whether or not a bed and breakfast business can make use of an interior designer really depends on the attitude of the owners and their vision for the business. If the B&B has a set clientele of a certain age in an area where people come for quiet relaxing breaks then you might as well break out the magnolia and the white gloss and be done with it. The money spent on an interior designer will be wasted as even the best looking interior will not be to their taste and your customers will be alienated. 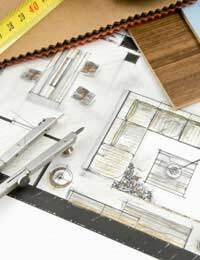 But if you are trying to elevate the business up market, or attract a different crowd, then there may well be mileage in getting an interior designer in. This is particularly the case if you have light airy rooms which you think could take strong colour schemes but you're not sure how to go about it. After all, if you're aiming for regal and sumptuous and you get dark and gloomy, then that's not going to attract that vital repeat and referral business. Most areas will have interior designers that you can find from the yellow pages or an internet search. As with any service that you are going to be paying for, like builders or food suppliers, meet with at least three people or companies before making a choice. You need to find someone who you feel you can work with and who will bring their own ideas to the table, but they will also need to be able to deal with you saying 'no' if you feel their ideas are too outlandish. Make sure you see some of their other projects and talk to their customers too, and consider using someone who's had experience with B&B's, or at least other establishments where members of the public are looked after. Consider an Interior Decorator for a Bed and Breakfast Instead? It is worth investigating to see if there are interior decorators around as well, although the distinction is a fine one. An interior designer will usually take on the whole project including the hiring and supervision of teams of workers, and will redesign walls, curtains, furniture, fixtures and fitting, not just the colour schemes, although they may do that if you ask them. An interior decorator, on the other hand, will simply look at the colour schemes for walls and doors, curtains and other soft furnishings. But an interior decorator will not manage contractors and take responsibility for the whole project. For many bed and breakfast owners this may in fact be perfect. You pay for the skill that you need, the choice of the colours, and can then take the job on yourself or hire your own decorators.